1. Clean the head inclusive of tongue, eyes, jaws and cheeks. 2. Cut into pieces and cook adding salt. 3. After the meat is cooked, remove skull bones. 4. Remove skin on tongue, palate and earlobes. 5. Cover tamarind with hot water for 15 minues and then squeeze out its juice. 6. Heat 4 tblsp of oil and then add the coarsely ground onions, ginger, garlic and curry leaves. 7. Cook them till soft, then add tomatoes, all the spices and salt. 8. When the mixture turns soft, add meat, fry nicely, then add tamarind and one cup of water. 9. Cook for 5 minutes and garnish with coriander leaves. Serve hot. 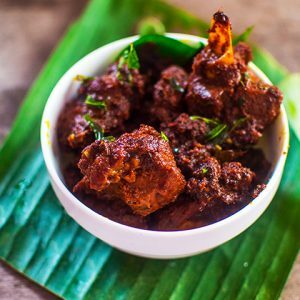 Feel free to comment or share your thoughts on this Goat Head Curry Recipe from Awesome Cuisine.